2 ARTICLES Notes on Egyptian Sorcery Chuck Hansen . . . . . 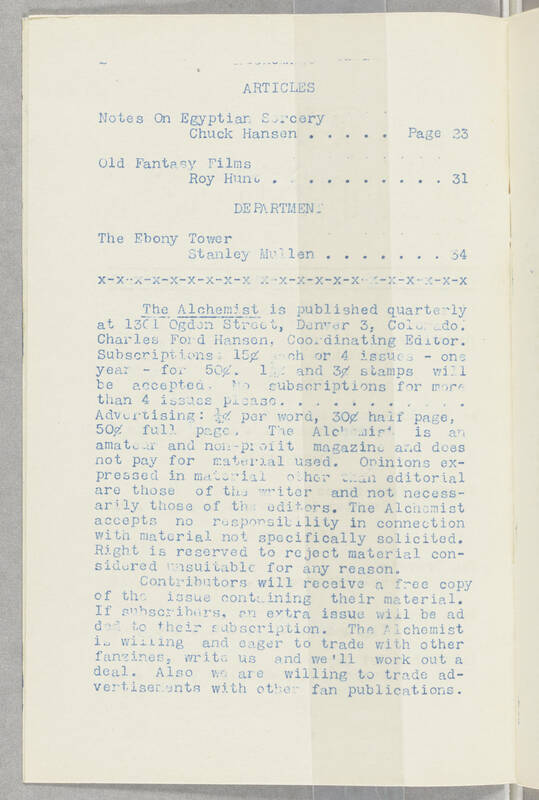 Page 23 Old Fantasy Films Roy Hunt . . . . . . . . . . 31 DEPARTMENT The Ebony Tower Stanley Mullen . . . . . . . 34 The Alchemist is published quarterly at 1301 Ogden Street, Denver 3, Colorado. Charles Ford Hansen, Coordinating Editor. Subscriptions: 15[[cent symbol]] each or 4 issues - one year - for 50[[cent symbol]]. 1 1/2 [[cent symbol]] and 3[[cent symbol]] stamps will be accepted. No subscriptions for more than 4 issues please. . . . . . . . . . . Advertising: 1/4[[cent symbol]] per word, 30[[cent symbol]] half page, 50[[cent symbol]] full page. The Alchemist is an amateur and non-profit magazine and does not pay for material used. Opinions expressed in material other than editorial are those of the writer and not necessarily those of the editors. The Alchemist accepts no responsibility in connection with material not specifically solicited. Right is reserved to reject material considered unsuitable for any reason. Contributors will receive a free copy of the issue containing their material. If subscribers, an extra issue will be added to their subscription. The Alchemist is willing and eager to trade with other fanzines, write us and we'll work out a deal. Also we are willing to trade advertisements with other fan publications.